With my back playing up I've not taken the camera out much and when I have results have not been great so I am dipping into the archives today to bring you this guy who refused to get up from his nap to have a dignified photo taken. Did you know that Spotted Hyaenas and African Painted Dogs are the natural predators of old, young or sick lions that are too weak to defend themselves? Find the lions in the African Savannah exhibit. Hi Stella, now that looks like one laid back lion. Bet he'd wake up if you got too close though! Hope your back gets better soon. I'll have to go back to the zoo and try for a more active shot. 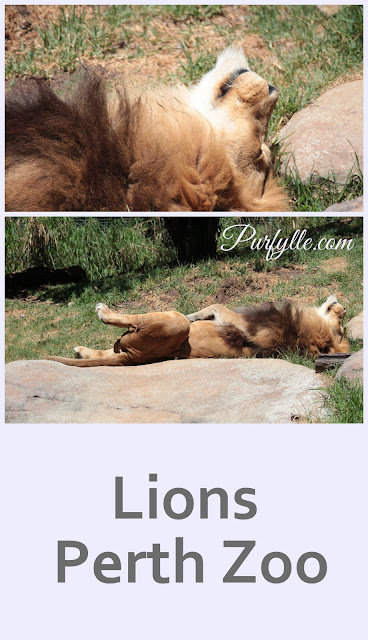 I don't think I've EVER seen an active lion in the zoo. Great shots of the stretching, though! I feel like that most mornings! Blooming love lions, they are amazing creatures. They are pretty amazing, I'm hoping they will come out for some better photo ops next time we hit the zoo. Cats do seem to behave like cats no matter what size they are. I was really frustrated that they wouldn't get up and come and pose for the camera. Well you have a good excuse! Stella, I pray your back is better. You made a whole comedy routine out of 3 photos! Love it, along with your title! Dr wants X-rays so we'll have to wait and see. I thought you might like that title. It's a hard life sleeping 14 hours a day and all. Isn't he supposed to be on guard duty? Nothing makes me happier then hearing I made someone laugh :o) thanks for making my day. Thats my soulmate right there. But with a glass of wine.